Make sure that there is a clear path through your yard decorations. If you put a lot of things in your yard, you may want to consider lighted ropes around the lawn’s perimeter so people can easily see where they should not go. And be sure to rake up any leaves or other yard debris that could get in the way. Dark lighting may be spooky, but be careful that the pathway to your home isn’t too dark. Light walkways with flameless lanterns or LED lights so that trick-or-treaters won’t trip or get disoriented. Avoid candles when you’re putting up lighting. Traditional jack-o-lanterns are lit with candles, but they are huge fire hazards. If a kid knocks over a pumpkin, you could end up with a big problem on your hands. Go with much safer flameless candles or battery-operated lights. If you put up strings of lights or use any electronics that need to be plugged in, make sure that you don’t overload your electrical outlets. Use surge protectors and don’t plug too many things in, or you might blow a fuse. Make sure any cords are out of the path of trick-or-treaters. 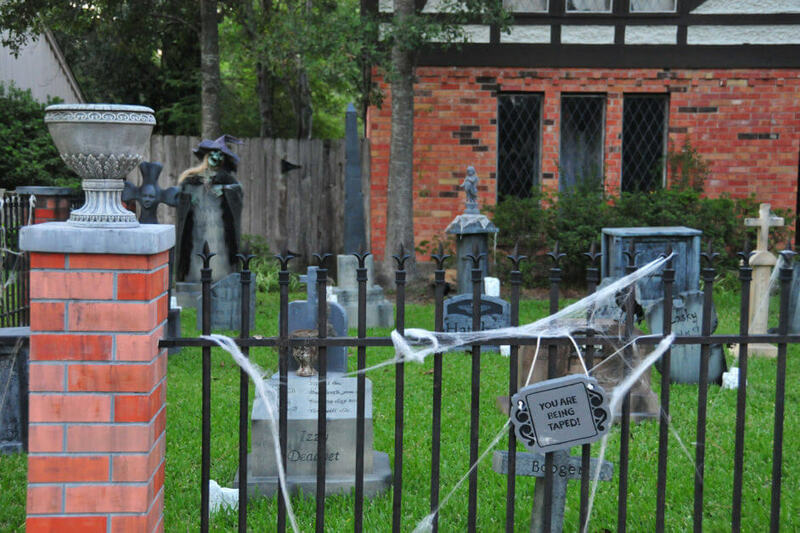 With the doorbell ringing all night, Halloween can be difficult for pets, especially dogs. Keep your pets in a safe, gated area with food and water, far away from trick-or-treaters (or any pranksters). Halloween is prime time for pranksters. Keep bicycles, lawn ornaments, and other small items inside or locked up. Put your car in your garage, if possible. Lock your doors if you leave to go trick-or-treating with your kids. After the typical rush of trick-or-treating is over, lock the door, turn off the lights, and don’t answer it anymore. Following these simple tips will keep you, your family, and those who come to your home safe during Halloween.